Sen. Cindy Hyde-Smith (R-MI) won her runoff election last night over Democrat Mike Espy in Mississippi, so Republicans have a solid 53-47 majority. No longer will we have to deal with the Murkowski-Collins question when it come sot tight votes of judicial and Supreme Court nominations. We can run the table on paper, but we have a Sen. Jeff Flake (R-AZ) problem. Yeah, Mr. Flake, the perpetual pain in the rear end of the Senate GOP, isn’t budging from his position of blocking Trump’s judicial nominees until a vote on a bill to protect Special Counsel Robert Mueller and the Russia investigation is brought before the Senate floor. For those who think Jeff Flake would have won in Arizona, let me remind you that his popularity in is state is straight trash, he barely won his 2012 race, and he most likely would have been picked off in a primary. 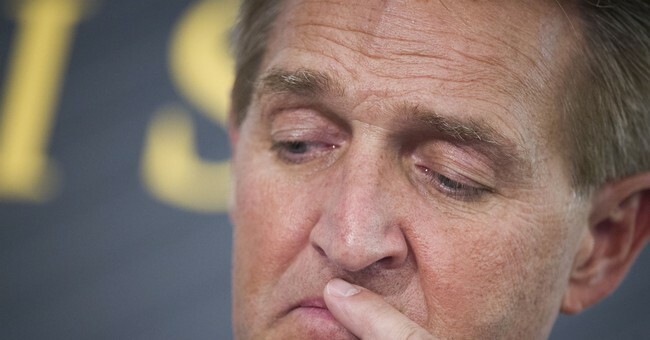 Jeff Flake cannot leave the Senate soon enough. Oh, and Flake and the late John McCain’s squishy antics seemed to have depressed Arizona GOP enthusiasm, so there’s that aspect. If Flake wants to run in 2020, and there’s some speculation that he’s considering it, he better be prepared to be ripped apart by angry conservatives for going out of his way to torpedo the Republican agenda on the Hill to spite Trump. Oh, and expect to be speaking to just a handful of people who show up at his low energy rallies. Get lost, dude.